Sleep Hibernate Shut down - Which to Choose? Sleep, Hibernate, Shut down – Which to Choose? Sleep Hibernate Shutdown – Which works the best? We did a recent poll on Facebook where we asked you what you did with your PC when done with it. Out of 25 responses, eight people said they put their PC in Sleep Mode. Two people said they Hibernated it. And the majority, 15 people, said they shut it down completely. There are advantages to all three approaches. Sleep mode puts your PC into a low-power state, and resuming from sleep happens within several seconds. Sleep mode does draw battery power, but very slowly. 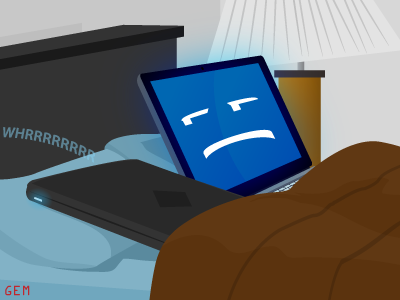 If the battery gets too low while in sleep mode, the PC automatically switches to Hibernate. Hibernate saves all your open documents and remembers the states of all your open applications and saves this information to your hard drive. Then, it shuts down the PC completely. Resuming from Hibernate has the advantage of re-opening all your recently used apps. Usually, only laptops will have this option. Shutting down closes all open applications and documents, giving you the option to save, and then turns off the PC. This saves more power than Sleep Mode and the same amount of power as Hibernate. Some respondents commented that they do neither, but simply walk away from the PC, sometimes turning the monitor off. This approach continues to use power, but has the advantage of running Windows Updates and antivirus scans, should they be scheduled during the night. Be sure that if you do shut down your PC, you remember to run such scans by hand.